Home of the Brave Collection Site – For the entire year we are gladly accepting items for our Veteran’s. 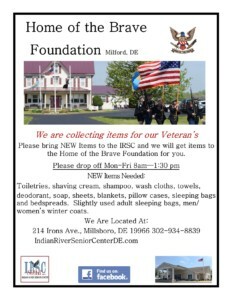 Please bring in NEW items to the IRSC and we will get items to the Home of the Brave Foundation for you. Drop off times: Mon – Fri 8 am – 1:30 p.m. Items needed: New Toiletries, shaving cream, shampoo, wash cloths, towels, deodorant, soap, sheets, blankets, pillow cases, sleeping bags & bedspreads. the IRSC is located behind the Wawa on Route 113, on 214 Irons Ave., Millsboro, DE 19966 302-934-8839. Thank you for all your donations! Indianriverseniorcenterde.com . 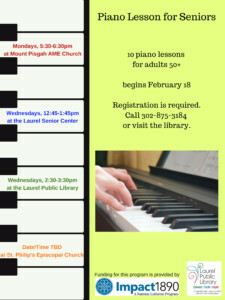 Weekly piano lessons for adults age 50+. These lessons are hosted by the Laurel Public Library through a grant from Impact 1890. Registration is required, and can be done through the link included or by calling the library at 302-875-3184. 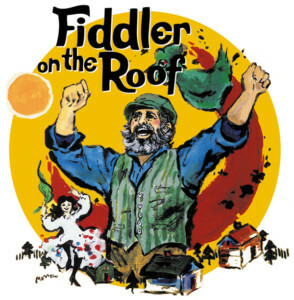 SCS presents the endearing story of Tevye, the Jewish Dairyman and his daughters as cultural and political events occur in their little Russian town of Anatevka. 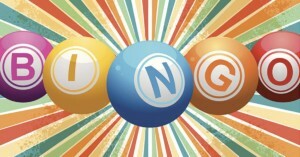 For show times, dates and ticket prices, visit our website at www.salisburychristian.org. Nanticoke Memorial Hospital will hold a heart failure support group on Thursday, April 25 from noon to 2:00 pm in the Nursing Conference Room. This free support group is designed for individuals with heart failure, as well as their families and caregivers to share stories, tips and tricks with others with this disease. Heart failure is a chronic condition where the heart doesn’t pump blood as efficiently as normal. This condition can be caused by conditions such as narrowed arteries in the heart or high blood pressure, which leave the heart too weak or stiff to pump efficiently. Nanticoke is engaging with speakers to provide education, community resources and emotional support to those who have heart failure. Attendees are encouraged to bring their medications to receive a free pharmacy consultation. Cancer doesn’t just affect the diagnosed person, it affects the whole family and everyone that supports them. Please join Louise White, LCSW, as she addresses the issues surrounding the important role of caregiver. Louise will help you make sense of the turmoil and learn practical ways of coping. A weekly support group is offered on Thursdays at 1 p.m. Please call 302-645-9150 to register and receive further information. All programs are offered free of charge to those with cancer and their loved ones. 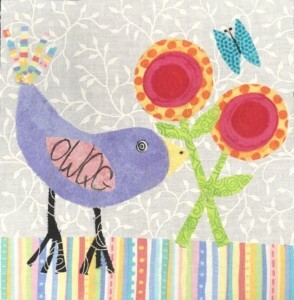 Ocean Waves Quilt Guild 2019 Quilt Show, “Birds, Blooms and Butterflies” – Sussex Academy, 21150 Airport Rd, Georgetown, DE – Over 300 quilts on display, Merchants’ Mart with 30 vendors offering quilting and non-sewing items for sale, raffle baskets/quilts, quilt appraisals, on-site catered food service. UMES Springfest taking place from 11 a.m. to 4 p.m., at the Student Services Center Courtyard. Will also feature UMES Open House and Carnival. For more information call 410-651-6411 (Admissions) or 410-651-6434 (Carnival).